Home / Reviews / A Winkle In Time Blu-ray Review! A Winkle In Time Blu-ray Review! It’s really hard to translate a classic novel to the big screen, especially when that novel has been read by every grade school child for the past few decades or so. Any change, however slight is seen as a deviation from the source material and if you stick too closely to the cherished text you get criticized for not bringing anything new to the table such as Zach Snyder’s Watchmen. It’s almost an unwinnable feat, and yet people try constantly to get it right. 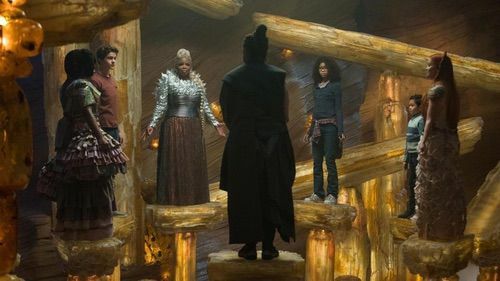 Disney’s A Wrinkle in Time is one of those films. 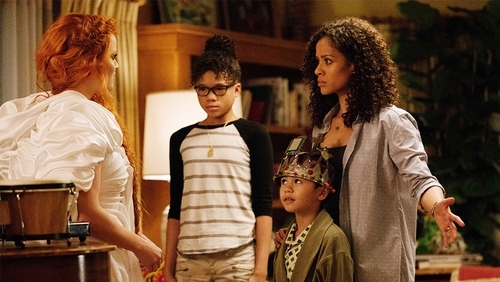 Out now on Blu-ray, A Wrinkle in Time suffers from the translation and deviation curse but it’s a fine film that suits the small screen well. With both of her parents considered geniuses, Meg Murray (Storm Reid) has a good lineage backing her up. Her parents (Chris Pine and Gugu Mbatha-Raw) are working on a project that say human beings can “Wrinkle” time and transport themselves to the far ends of space. This is called “The Tesseract” (which is not to be confused with the glowing orb from The Avengers). Meg’s father disappears and never comes home, it’s now been four years and there’s still no sign on him. Meg’s life has taken a downward spiral, she’s bullied and not adjusting well to her school or growing up. She’s a somewhat celebrity, think the supporting character on a VH-1 reality show, somewhat and you get the idea. Making matters more difficult, her younger brother Charles Wallace (Deric MaCabe) is a unique soul who marches to the beat of his own drummer. Meg struggles with many things a normal adolescent would and struggles with her own identity and self confidence. Meg comes home one day to find a woman dressed in bright clothes who goes by the name of Mrs. Whatsit (Reese Witherspoon). Mrs. Whatsit introduces Meg and her friends to other mystical women like Mrs. Which (Oprah) and Mrs. Who (Mindy Kaling). They tell Meg and Charles they can help them find their father and reach the farthest end of the universe. This journey will change Meg’s perception on life, her school, family and everything that she knows. 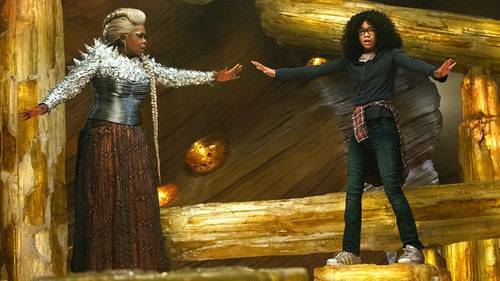 A Wrinkle in Time, is not a perfect movie, it’s a rough film that struggles at times to keep up it’s pacing and keep its plot on track. The themes, just like in the book are great, Self confidence, Believing in yourself, hope, etc… and I think it’s great especially for young girls to see a movie that upholds these values. Meg meets new people and sees new worlds and yet she continues to struggle with self confidence which is the thing holding her back. Admirable story telling, but a bit awkward in the execution. These are heady and heavy themes, yet Meg never comes together as a complex individual. Instead, she just seems unformed and fairly shallow, which is really unfortunate. The film has its fair share of tender and emotional scenes that really do make an impact, however. It’s a very sincere film that wears its heart on its sleeve. I love the cinematography and the visuals are really stunning. I think in the hands of a more seasoned director and perhaps one more used to fantasy storytelling, the film would be way more layered and complex. As it stands, A Wrinkle in Time doesn’t live up to the source material, but is worth a look nonetheless. 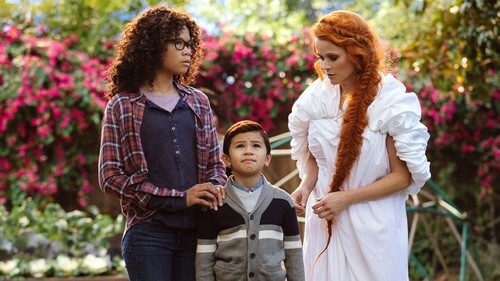 A Wrinkle in Time arrives on Blu-ray in a fine transfer thanks to Walt Disney Studios. The picture quality, as is on most Disney releases, is excellent. It’s a visual delight, with sharp details and crystal clear images that literally pop off the screen. There is little to no fallout even in the darker scenes and the detail one can make out in the ornate costumes is incredible. So well done. Bloopers – About a minute or two of botched takes. Deleted Scenes – There are about nine and a half minutes of deleted scenes included on this release. Audio Commentary – Director Ava DuVernay, First Assistant Director Michael Moore, Visual Effects Supervisor Richard McBride, Screenwriter Jennifer Lee, Producer Jim Whitaker, Film Editor Spencer Averick, and Production Designer Naomi Shohan come together for a very insightful commentary track. Music Videos – There are two music videos from the film included. Overall, I liked the film, it has great themes that should really resonate with young girls especially. The ability to believe in yourself is a rare thing these days and I’m all for a film with a message. It’s a decent adaptation, not perfect by any means but worth family movie night on Blu-ray. 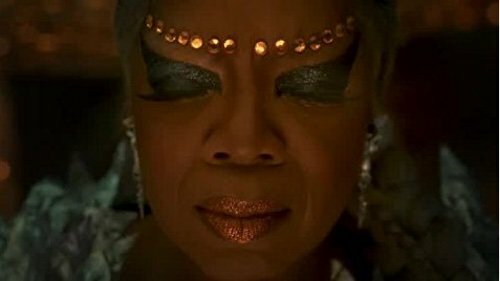 A Wrinkle in Time is out now on Blu-ray! Big Blu-Ray Movie Review! 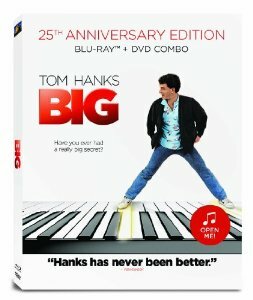 The Tom Hanks Classic Gets An Awesome Reissue On High Definition! Toy Story That Time Forgot Blu-ray Review! How Does The Newest Adventure With Woody And Buzz Compare To The Classic Trilogy?